Background: Cancers in children are increasing all over the globe, however, the outcome in LMICs is still quite poor due to a myriad of factors. Aim: This review focused on pattern of admissions in a pediatric oncology unit in Lagos, Nigeria and the determinants of outcome. Settings and Design: This was a retrospective descriptive study at the Lagos University Teaching Hospital from January 2015 to July 2017. Common treatment protocols like UKALL, NWTSG etc are adapted for use in the unit. Data Analysis: This was done using SPSS version 22. Results: A total of 178 children were seen at the oncology unit with a slight male preponderance of 1.4:1. The most common malignancy seen was acute lymphoblastic leukemia (20.8%) while retinoblastoma was the commonest solid tumor (19.6%). Mortality rate observed in the period under review was 45% and a large number of patients (22%) abandoned treatment. Conclusion: The management of childhood cancers is still a big challenge in resource constrained settings and a robust health insurance policy will improve outcomes. An estimated 200,000 children are diagnosed annually with childhood cancers with over 50% of them dying due to poor infrastructure, lack of diagnosis, or general lack of access to care and with most of these deaths occurring in low- to middle-income countries (LMICs).,,, While survival rates of most cancers in the developed world over are around 85%–90% for most cancers, in the LMIC, mortality rates are approximately 75%–80%. Pediatric oncology care in resource-constrained settings is bedeviled by many challenges such as poor infrastructure, inadequate workforce, absence of chemotherapeutic agents, and poorly developed health insurance., Another major challenge is the lack of attention given to pediatric oncology. Most of the attention is on adult-type cancers such as breast, prostate, cervix, and colon. In Nigeria, there is no comprehensive cancer center or standalone pediatric oncology units. Most institutions have general wards for other pediatric cases, and children with cancers are admitted to these wards. As a first step to improving the quality of care, the Lagos University Teaching Hospital (LUTH) designated the first solely pediatric oncology ward in 2011. The unit is an 18-bed ward with a procedure room, kitchen, and play area. The unit uses treatment protocols from Europe, USA, as well as SIOP guidelines with locally adapted modifications. We reviewed admissions, course of treatment, outcomes, and determinants of completion of treatment in the unit over the last 30 months. This was a retrospective, descriptive study from January 2015 to July 2017. The study location was the Pediatric Hematology/Oncology Unit popularly called “oncology ward” of the LUTH, Idi-Araba, Lagos, Nigeria. This is one of the major teaching hospitals in Nigeria providing healthcare to an estimated population of 38 million inhabitants in Lagos and surrounding states. The clinical notes of the patients were reviewed for demographic data as well as clinical information. The treatment protocol was documented for all confirmed patients. The outcome was classified as survived or deceased. Those patients who abandoned treatment received phone calls from the unit. Only 30% of them responded to the calls and the patients were all dead. Treatment outcomes were classified as completed treatment which was described as survived and in follow-up, dead, and abandoned treatment for those whose phone numbers could not be reached. Patients who were on admission at the time of compilation were described as on admission. All information were imported into an excel sheet. Ethical clearance was obtained from the Hospital's Health Research and Ethics Committee. A total of 178 children were seen on the oncology ward of LUTH between January 2015 and July 2017. There was a slight male preponderance with a ratio 1.4:1, with the age ranging from 8 weeks to 16 years, with a mean age at 5.8 ± 4.4 years. Three years was the most common age at presentation for all tumors. The most commonly occurring tumor diagnosed in Luth between 2015 and 2017 was leukemias (30.3%); acute lymphoblastic leukemia (ALL) was the most common leukemia (20.8%); acute myeloid leukemia and chronic myeloid leukemia had the same prevalence at 2.3% [Table 1]. Retinoblastomas were the second most common malignancy seen with a prevalence of 19.6% while Wilm's tumor was the third most common malignancy with a prevalence of 16.9%. Hodgkin's lymphoma was the most common lymphoma (5.6%), non-Hodgkin's lymphoma (2.3%), and Burkitt's lymphoma (1.1%) [Table 1]. Other rare forms of malignancies seen were hepatoblastoma, hepatocellular carcinoma, renal cell carcinoma, ovarian teratoma, lung spindle cell cancer, and germ cell testicular tumor [Table 1]. Variations in distribution of presentation were noted over the months; there was no identified pattern (peaks or troughs) noted over the months. Data could not be collected over certain months as the hospital was on industrial strike [Figure 1]. Mortality rates for the patients accounted for over a 30-month period were as high as 45%. Only 25% of patients seen in the 30-month period were treated and discharged to go home [Figure 2]. About 22% of the patients abandoned treatment. This commonly occurred following the second course of chemotherapy. The most common reasons for abandonment of treatment included financial constraint and seeking traditional or spiritual solution. A small percentage of patients were discharged against medical advice or voluntarily refused treatment while the rate of relapse was 1.7% [Figure 2]. Tumor types with the highest mortality included neuroblastoma, brain tumor, and osteosarcoma while Wilm's tumor, lymphomas, and retinoblastomas had lower mortality rates. 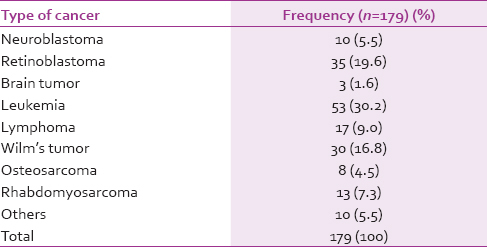 However, unlike what has been reported in most African publications, ALL was the most common malignancy reported in this review [Table 1].,, This is consistent with what is prevalent in most parts of the developed world. The reason may be due to the aggression of the unit to make a diagnosis within 1 week of presentation. Most patients with ALL present at advanced stages with symptomatic thrombocytopenia and may not survive for appropriate diagnosis to be made. In most parts of the developed world, diagnosis will be made in 48–72 h unlike in LMICs where diagnosis may run into weeks. Thus, it is likely that most of these children will die before diagnosis is made. Unlike most reports from Africa, Burkitt's lymphoma is not very common in Lagos. Only 1.12% of the children had a diagnosis of Burkitt's lymphoma [Table 2]. This is at variance with most of the reports from other parts of Nigeria and Africa where Burkitt's is reported to be the commonest or one of the most common childhood cancers.,, This may be due to possible environmental influences on the genes of children residing in Lagos or the possibility of a near absence of malarial infestation in most of the inhabitants of Lagos since this is the commercial nerve center of Nigeria with a difference in health-seeking behavior. Thus, we may conclude that individuals in Lagos will treat malaria better and the general environmental hygiene will be higher leading to a reduced prevalence of malaria and its comorbidities. The high rate of abandonment of treatment in this review is similar to that reported in other parts of Africa [Figure 1]. The factors responsible for treatment abandonment are similar to those reported in other reports., However, a lack of health insurance was a major factor for treatment abandonment in this review. Over 85% of the caregivers paid out of pocket for treatment, and most of the providers suffer provider fatigue by the second course of chemotherapy. The factors identified in this present review were not different from those identified in an earlier report from Ilorin, Nigeria, 12 years ago. The overall mortality recorded in this review was 45.5% which is similar to what has been described for most of the continent [Figure 2]. Acute myeloid leukemia has the worst prognosis recording 100% mortality in this review See [Table 3]. Despite the late stages of patients with nephroblastoma, the mortality rates were 25% which is quite comparable to what is documented in literature see [Table 3]. The improvement in Wilm's tumor statistics is due to the multidisciplinary treatment approach that has been implemented in the hospital. The same intervention has also been introduced for retinoblastoma and the mortality figures are also low at 35% [Figure 2]. Neuroblastomas though not as common in the West were not as uncommonly described in some other reports in Africa., This report shows that they were not a rarity in our practice. Generally, this report highlights some differences about the presentation of common childhood malignancies in Lagos as opposed to those reported in other parts of Nigeria as well as Tropical Africa. A strong health insurance policy by government to enhance access to cancer care for all children with childhood cancer will improve outcome data. The parents will also need strong social support while the kids are on admission. We believe that it will be important to search for possible genetic differences among the children presenting with cancers from the different geographical zones of the country. McGregor LM, Metzger ML, Sanders R, Santana VM. Pediatric cancers in the new millennium: Dramatic progress, new challenges. Oncology (Williston Park) 2007;21:809-20. Kellie SJ, Howard SC. Global child health priorities: What role for paediatric oncologists? Eur J Cancer 2008;44:2388-96. Ndom P. Challenges of anticancer chemotherapy in Africa. Can J Urol 2008;15:3909-11. Mostert S, Arora RS, Arreola M, Bagai P, Friedrich P, Gupta S, et al. Abandonment of treatment for childhood cancer: Position statement of a SIOP PODC Working Group. Lancet Oncol 2011;12:719-20. Agboola AO, Adekanmbi FA, Musa AA, Sotimehin AS, Deji-Agboola AM, Shonubi AM, et al. Pattern of childhood malignant tumours in a teaching hospital in South-Western Nigeria. Med J Aust 2009;190:12-4. Samaila MO. Malignant tumours of childhood in Zaria. Afr J Paediatr Surg 2009;6:19-23. Welbeck JE, Hesse AA. Pattern of childhood malignancy in Korle Bu Teaching Hospital, Ghana. West Afr J Med 1998;17:81-4. Schroeder K, Saxton A, McDade J, Chao C, Masalu N, Chao C. Pediatric cancer in Northern Tanzania: Evaluation of diagnosis, treatment, and outcomes. J Glob Oncol 2017. JGO.2016.009027. [Doi: 10.1200/JGO.2016.009027]. Kareem OM, Aribaba OT, Oluleye TS, Olowoyeye AO, Akinsete AM. Challenges of retinoblastoma management in a Nigerian tertiary eye care facility. J Clin Sci 2017;14:182-7. Bowman RJ, Mafwiri M, Luthert P, Luande J, Wood M. Outcome of retinoblastoma in East Africa. Pediatr Blood Cancer 2008;50:160-2. Maliti BK. Management of retinoblastoma in Zambia. Asia Pac J Oncol Nurs 2017;4:184-6. Slone JS, Chunda-Liyoka C, Perez M, Mutalima N, Newton R, Chintu C, et al. Pediatric malignancies, treatment outcomes and abandonment of pediatric cancer treatment in Zambia. PLoS One 2014;9:e89102. Meremikwu MM, Ehiri JE, Nkanga DG, Udoh EE, Ikpatt OF, Alaje EO, et al. Socioeconomic constraints to effective management of Burkitt's lymphoma in South-Eastern Nigeria. Trop Med Int Health 2005;10:92-8. Kutluk T, Varan A, Büyükpamukçu N, Atahan L, Cağlar M, Akyüz C, et al. Improved survival of children with wilms tumor. J Pediatr Hematol Oncol 2006;28:423-6. Miller RW. No neuroblastoma in Zaire. Lancet 1989;2:978-9. Parkin DM, editor. Cancer in Africa: Epidemiology and Prevention. IARC Scientific Publications No. 153. Lyon, France: IARC; 2003.